Saw this and its pretty cool. Has pix on how they did it too. A couple converted a bus into a home and they live on a different street every three days according to law. haha. Only $100 in maintenance expenses per month, no rent or mortgage. Main drawback I see is that they do not have running water. The toilet is composting. Electric is solar. I would need about three buses for my crew, hahaha, but its pretty neat. They have good jobs too I think, so they are probably building up quite a nice bank account. I wonder where Danny Bonaduce sleeps? streaker69;65051 Wrote: I wonder where Danny Bonaduce sleeps? The bus isn't the right color. He has a room in Rehab. My wife and I love the Proenneke show. We fantasize about doing that, and I wish I had half his talent. 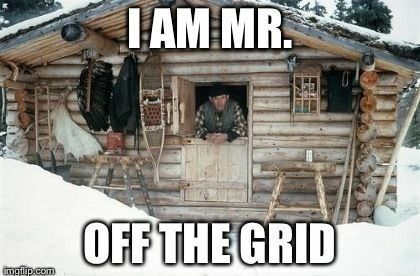 Wouldn’t really call that living off the grid, unless the reference is about utilities. My folks lived on their houseboat for a number of years, in Florida, until my mother got tired of having no real space for storage. I lived on the boat for awhile. My brother lived on it the longest, for about fifteen years, but he never ran it out in open water, which my folks did, from the east coast to the west coast, but they were retired. If you have no desire to accumulate crap, not a bad way to go, and watching the sun rise or set on the water is cool, but for a family, there is no privacy. Gun;66193 Wrote: Wouldn’t really call that living off the grid, unless the reference is about utilities. It almost kinda is...no address, no utilities, no reliance on outside help except gasoline and bottled water and food, I guess. Like I said...I bet they have a BIG bank account. They're probably going to end up with an awesome place somewhere after they save up long enough living in that bus. After enough time of living like that, any 2 bedroom home in the burbs would be like a mansion. I couldn't even begin to imagine living like that, I'm not into deprivation. I'd rather be comfortable today, I don't know if I'll be alive tomorrow.